I`m HempPowder from Alpenpionier and i love nothing better than to slip into a smoothie, mingle with some muesli and blend with bread and pastries. I pair well with pasta and all kinds of other delicacies, too. I want to enrich each day with ease and simplicity, so when it comes to your dietary needs, I`ve basically got everithing covered. I maintain all the essential amino and fatty acids, especially the ratio between omega3, 6 and 9, in a dignified balance. I don`t mean to brag - but I really do excel in this area. And while it can be lonely at the top, my roots are luckily not far away, in Tschiertschen, in the valley of Schanfigg, where my ancestors were planted many moons ago. This year, I relished growing locally and organically on many beautiful sunny days in the Swiss Alps. The mountain farmers took really good care of me.- Hey, have a fun and vibrant day! 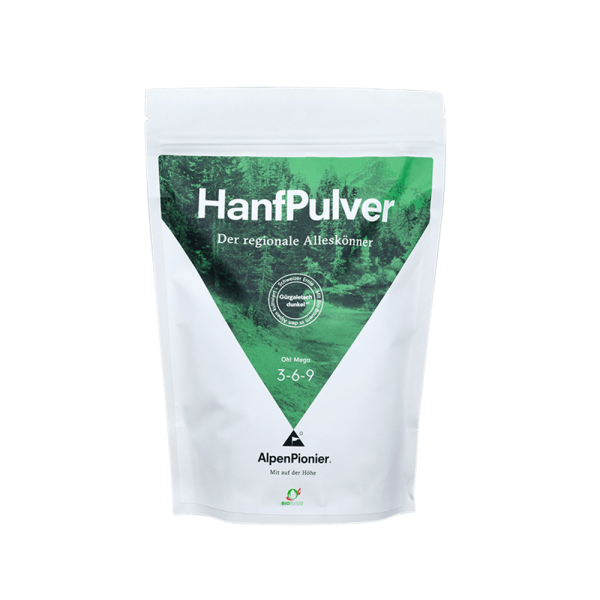 I`m Hemp Powder from Alpenpionier and i love nothing better than to slip into a smoothie, mingle with some muesli and blend with bread and pastries. I pair well with pasta and all kinds of other delicacies, too. I want to enrich each day with ease and simplicity, so when it comes to your dietary needs, I`ve basically got everithing covered. I maintain all the essential amino and fatty acids, especially the ratio between omega3, 6 and 9, in a dignified balance. I don`t mean to brag - but I really do excel in this area.